This book offers an overview of art in the 19th centurry through art books on leading artists and themes, and many photos of book covers. 19C ART BOOKS serves as a bibliography of art books, offering complete information on art books, never before available, including basic information such as book titles, authors, publishers, year of publication, number of pages, number of black & white and color illustrations, size of book, hardcover, softcover, language, catalogue raisonne, and museums that held exhibitions, in addition to reprint or previous edition information and the joint publishing information in each country. It also includes briefings of each of the books and features photos of the covers of the main books at the end of the book. 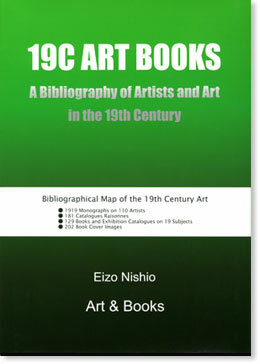 19C ART BOOKS is a bibliography providing complete information on art books required by not only art professionals such as museum and university workers, librarians, and researchers, but also by those who truly love art and art books. 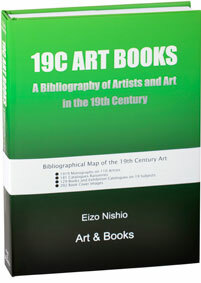 19C ART BOOKS contains the data on 2048 art books published between 1858 and 2012.